Tony Mann attended the Atiyah/Villani(/Stewart) event at Tate Modern yesterday and wrote a review of this for his blog. He discusses several interesting ideas from the discussions – “a few that resonated with me” – including on problem solving, history and the practice of doing mathematics in relation to art, barriers and the place of blackboards. Tony notes that the event was being recorded so we might look forward to a recording that can be viewed later. Read Tony’s review: Atiyah and Villani at Tate Modern – the value of blackboards. Sir Michael Atiyah and Cédric Villani, Fields medallists, holders of a frankly embarrassing number of other awards, and highly entertaining speakers, will be having a conversation “to explore mathematics and topology” at Tate Modern, London, on June 2nd, following a screening of the film Au Bonheur des Maths. 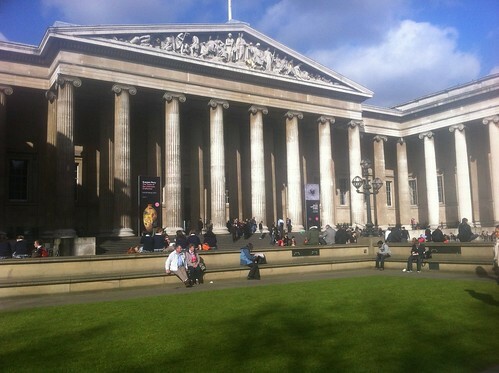 Having enjoyed a quick dip into the British Museum I headed to Lincoln’s Inn Fields. 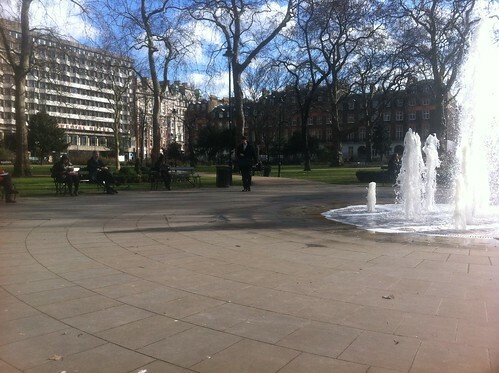 The Camden Council website describes Lincoln’s Inn Fields as “the largest square in London and the oldest in Camden”, noting that “there has been public open space here since at least the 12th century” and the space was once “popular for duellists” and known for a “minor speaker’s corner”. I had come to Lincoln’s Inn Fields to visit Sir John Soane’s Museum (left of the photo above). The clue I tweeted to my location was the scaffolding on the outside of the museum. David Ault pointed out that this was a poor clue as it contained the name of the museum! 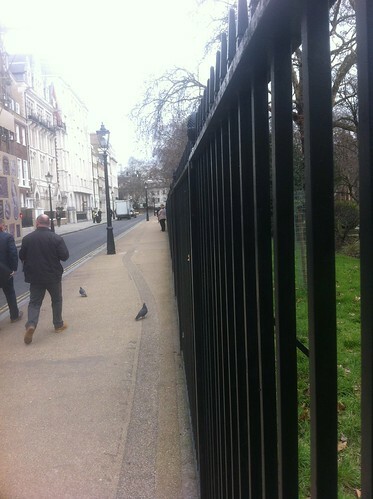 I also tweeted the above photo of Lincoln’s Inn Fields, which Speakers for Schools guessed correctly. as a setting for his antiquities and his works of art. After the death of his wife (1815), he lived here alone, constantly adding to and rearranging his collections. Having been deeply disappointed by the conduct of his two sons, one of whom survived him, he determined to establish the house as a museum to which ‘amateurs and students’ should have access. House packed with loads of ancient stuff and architectural bits and so on. Free to get in between 10 and 5, but there’s usually a bit of a queue. The queue was minimal and I was able to enter the house. I had downloaded the audio tour, prepared to spend the recommended hour exploring the house, but I had arrived too late to begin this. What I saw from a quick dash (no photos, I’m afraid) was interesting and I definitely intend to go back when I had more time, but I had less than half an hour until I had to dash onwards to my first timed appointment of the day. I’ll save that for a later post. 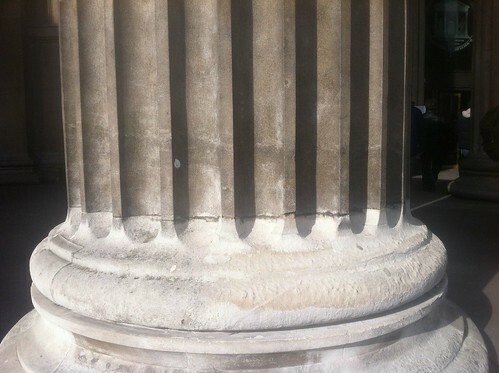 Thinking I was being too obvious, particularly having just told Twitter I was in Russell Square, I tweeted a photo of the base of a pillar as a clue to my next location. I hadn’t intended this to be a stop on my trip as I’ve been before but, having had lunch by the fountain in Russell Square Gardens, I couldn’t resist a few minutes inside the British Museum. 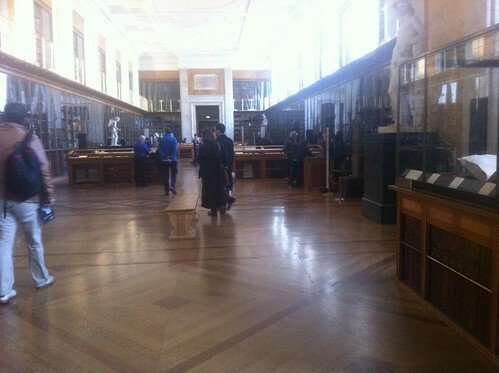 I made my way to the Enlightenment Gallery. I enjoy this room, which usually seems calm (relative to the bustling Egyptian galleries opposite) and is full of interesting small pieces including scientific instruments. I hadn’t realised but I had just missed the “eye–opener gallery tour” (Free; Daily, 12.30; for 30–40 minutes). Having seen the King’s Library in the British Library earlier that morning, I was interested to read that this room was the previous location of the same library. 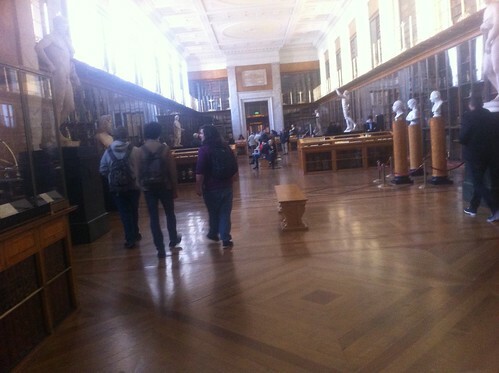 Apparently its donation caused a building programme to expand the British Museum and this room was built in 1827 specifically to house the new library. Repairs to the oak and mahogany floor and classical architectural features have refreshed the space. Hundreds of square metres of plaster were cleaned to restore the yellow and gold ornamentation and the re-gilded balcony. Two hundred kilometres of wiring (twice round the M25 motorway) enabled a subtle lighting system to be installed, which aims to complement the newly-restored colour scheme. The result was that two centuries of use and London grime were washed away and a major permanent exhibition, using thousands of objects from the Museum collection to show how people understood their world in the Age of Enlightenment, was created. I said that was fortunate! On my way out of the museum I popped my head around the corner to the Rosetta Stone. The story of this stone is fairly famous and often, in my experience, mentioned in talks on cryptography. After the stone was rediscovered in 1799 by Napoleon’s soldiers near the town of el-Rashid (Rosetta). 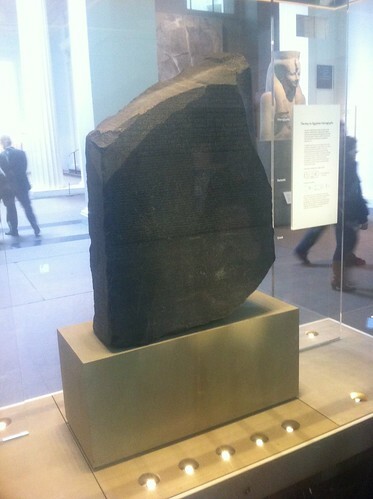 The stone passed to British hands in the Treaty of Alexandria (1801), being exhibited in the British Museum since 1802 (apart from briefly moving to a safe location during wartime). The Enlightenment Gallery houses a replica of the stone positioned as originally displayed. inscribed on the stone three times, in hieroglyphic (suitable for a priestly decree), demotic (the native script used for daily purposes), and Greek (the language of the administration). The repetition of the same text in three languages was important to modern understanding of hieroglyphs, and through them our understanding of ancient Egyptian culture. Thomas Young, an English physicist, was the first to show that some of the hieroglyphs on the Rosetta Stone wrote the sounds of a royal name, that of Ptolemy. The French scholar Jean-François Champollion then realized that hieroglyphs recorded the sound of the Egyptian language. After my short but enjoyable visit to the museum, I moved on to my next location, which I will save for a later post. Having visited the British Library on stop 1, I bought a sandwich for lunch and walked down to Russell Square. The clue I tweeted to my location (below) was nicely ambiguous, looking like a fairly standard London scene. 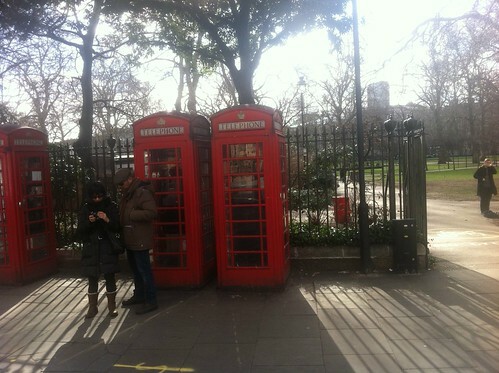 David Ault, winner of the photo clue competition at stop 1, attempted a “CSI ‘Zoom… Enhance…’” on the phone boxes but failed. A page on the Camden Council website gives a timeline of history of the Russell Square. The origins are in 1545 when the first Earl of Southampton purchased the manor of Bloomsbury from the Crown, and particularly in 1669 when the Russell family acquired the Estate. A period of building in the late 18th and early 19th centuries led to the laying out of a garden in Russell Square in 1806. It was in these gardens that I sat for my lunch, by a fountain that was added in a re-landscaping in 2000-1, “loosely based” on the original layout. I visit Russell Square often, though not often the gardens, as it is the location of De Morgan House, headquarters of the London Mathematical Society (LMS). The photo below shows a view from the fountain towards De Morgan House. According to a brief history given on the LMS website, the formation of the society took place in a fashion of founding new “specialised scientific outlets” in the 19th century, including societies for geology (1807), astronomy (1820), statistics (1834) and chemistry (1841). Originally associated with University College London (incidentally, on the other side of Russell Square), the LMS held its first meeting at University College on Monday January 16th 1865 with Augustus De Morgan, the founding professor of mathematics at University College, as its first President giving the opening address. The idea for the society came from De Morgan’s son, George Campbell De Morgan, and Arthur Cowper Ranyard, both former students at University College, who felt “it would be very nice to have a Society to which all discoveries in Mathematics could be brought, and where things could be discussed, like the Astronomical [Society]”. Having operated from offices in various locations, the Society located in (and renamed) De Morgan House in 1998. The building now holds a conference venue and a room used by the IMA for meetings, one or other of which is where I tend to be going when I visit Russell Square on ordinary days. The square is also the home of the Russell Hotel. This is a significant location because the hotel gives its name to the Russell Group of 20 universities which, according to its website, are “committed to maintaining the very best research, an outstanding teaching and learning experience and unrivalled links with business and the public sector”. The Russell Group was founded and originally met in the hotel. Having finished my lunch, I moved on. I will save my next stop for another post. Next Tuesday I will spend a day off in London. I am asking people to offer suggestions for things I could do with my time by adding pins to this Google Map: PR’s Day Off. A few people have already added their suggestions but it would be great to hear more. Date is Tuesday 21st Feb.
Free or low cost. It’s expensive just to get to London. I have a zone 1 & 2 tube card. Train times are non-negotiable (fixed tickets). I am going on the Maths in the City tour. Make suggestions for places to go and things to see by putting pointers on the map. Explain why and give timings and a link if appropriate. For timed events: Remember to allow enough time for travel (for someone who doesn’t know where they are going). Please don’t delete other people’s entries. If you disagree, by all means leave a comment to say so but don’t delete something you haven’t put there. If you can’t get the Google Map to work please leave your suggestion in the comments of this blog post. a place where people from all the bits of the science communication industry could share their latest work, in a performance-based way, and then chew it over with a pint in hand (or a whisky in hand). We also wanted it to be democratic, with space for people we see all the time, as well as people we’ve never seen perform before. A lot of people have heard of the Golden Ratio, but many, even those who have read Dan Brown books, might not know exactly what it is. I will give several illustrative explanations, using stuffed rabbits and slagging off TV presenters, and hopefully give you some idea of why I think it’s incredibly lovely. I’ll be trying out a new singalong song that encompasses time, space, mathematics and philosophy. Features live powerpoint! Rhys “Lightning” Phillips will be looking at what happens when planes are hit by lightning and showing cool videos of things going bang in a lightning lab! He’ll also be pondering on why song writers think that lightning is frightening. Full line up: Science Showoff 5 (will make you get down) LINE-UP ANNOUNCED(1 February 2012).